EN Ever thought about holding a knife thrower meetup for your friends (or the whole country), but didn't know where to start? Fret not, Super Thrower will come to the rescue! Eh, not quite. 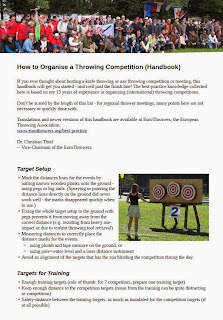 But the European Knife Throwing Association just published a Handbook on How to Hold a Throwing Competition - with comprehensive chapters on all aspects from target-setup to budget and assitance to participants. So, get ready to hold your own knife throwers competition! DE Jemals darüber nachgedacht, ein Messerwerfer-Treffen hinten im Garten zu veranstalten - paar Freunde einladen, paar Zielscheiben, und.... Mh, was braucht man alles noch dazu? Dann gleich mal ein paar Freunde einladen zum Werfen!